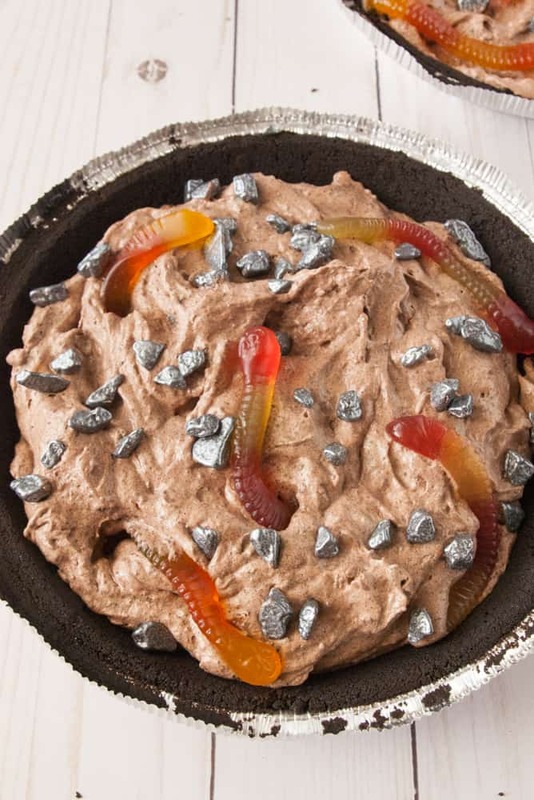 This faux mud pie is all about kids! It’s not glamorous, but it is messy fun complete with “worms”, “sticks” and “rocks” made of chocolate! As I was trying to think up a fun “Halloween” themed recipe for this week something on TV caught my eye. My son was watching one of his favorite shows and the character on it was making mud pies. He said, “What if you could really eat a mud pie!” Ding, ding, ding….light bulb! 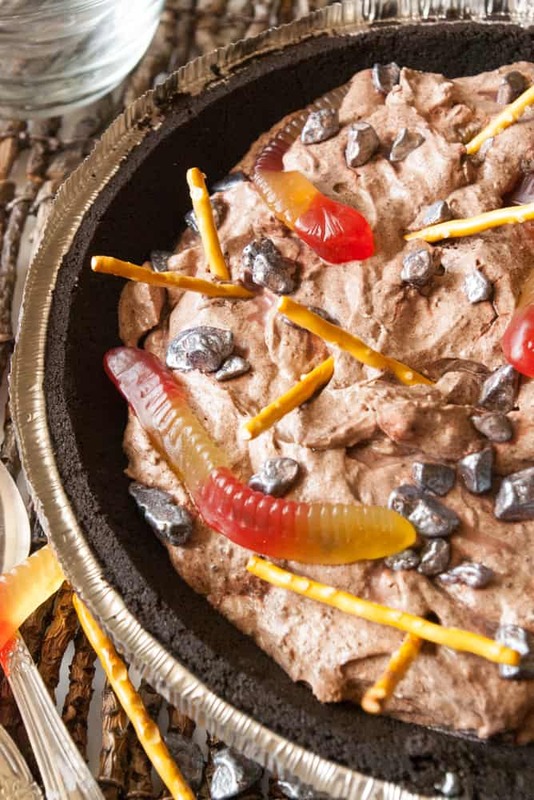 So this weekend we whipped up a faux mud pie, complete with worms, sticks and rocks. It’s may not be pretty but it was a lot of fun to make and my kids had a blast eating “mud pie”! This is a super easy no bake pie. Whisk together a 3.4 package (small) of instant chocolate pudding with 1 1/2 cups cold milk. Set aside and crush 15 oreo, creme filling and all into fine crumbs. I like to use my food processor for this. Then fold an 8 oz. 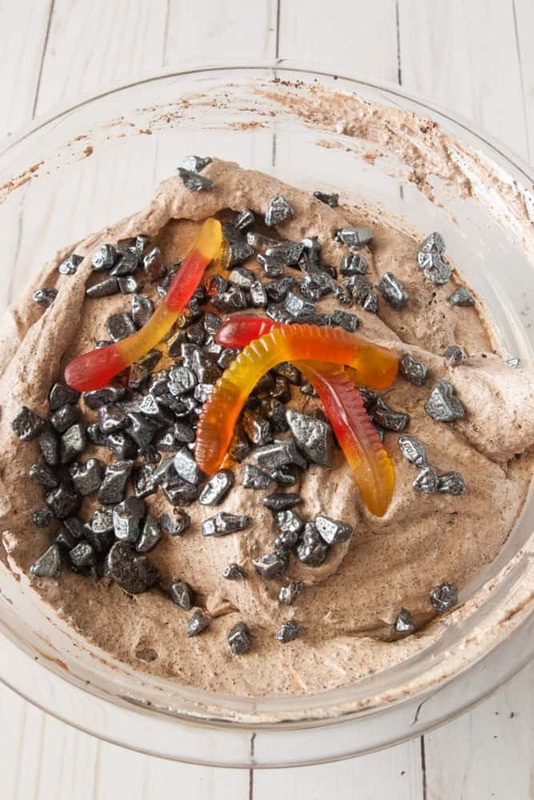 tub of cool whip and the oreo crumbs into the chocolate pudding to create your “mud”. These are the “rocks” I used. I bought them at Hobby Lobby by the construction themed party stuff. Coarsely chopped silver sixlets would work just as well though. 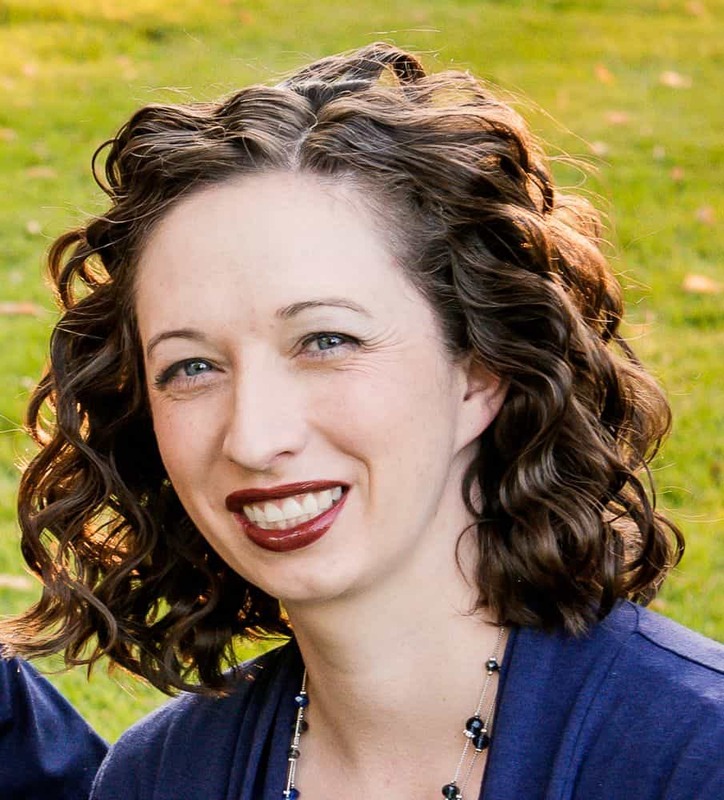 Fold in the rocks and gummy worms. I think the next time I make this I will cut the worms in half or thirds and just use full worms for the top garnish. Divide your faux mud pie mixture between 2 premade Oreo crusts. Garnish with additional rocks and gummy worms. Put your mud pies in the fridge for a couple hours. Poke pretzel sticks in your mud pie just before serving so they don’t get soggy. Scoop out and serve! 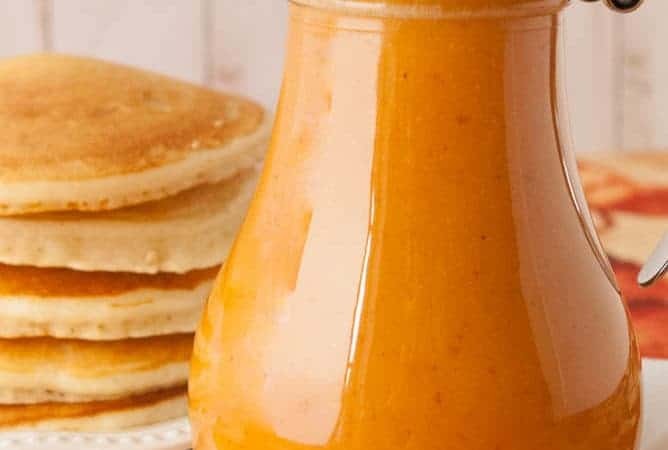 Whisk together the cold milk and pudding mix. Set aside. Crush the oreos into fine crumbs. 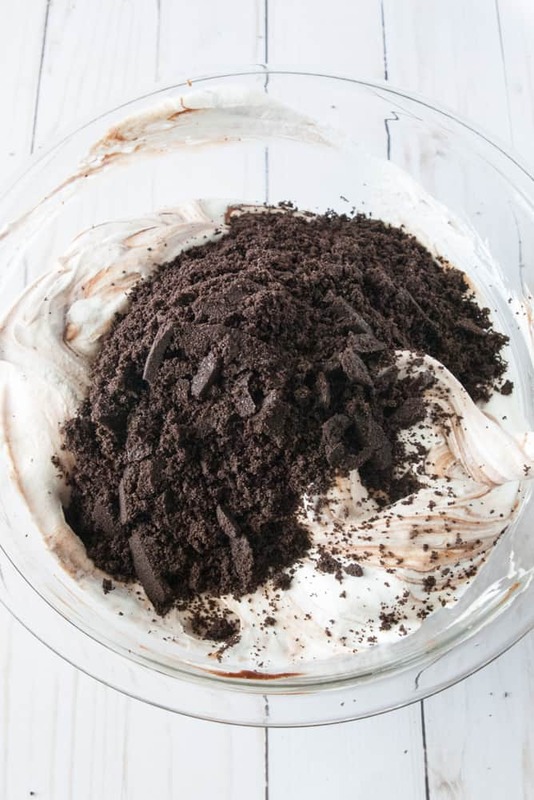 Fold the oreo crumbs and cool whip into the chocolate pudding to make your mud. 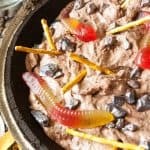 Fold some choco rocks and gummy worms into the “mud”. 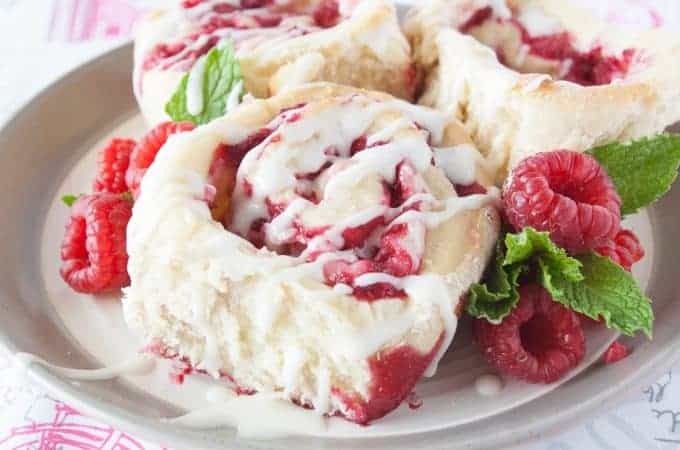 You may want to cut up the worms into halves or thirds and save some full size ones for the top garnish. Divide your mud pie mixture between 2 premade oreo crusts. Garnish the tops with some more rock and worms. Chill your mud pies for a couple hours. Poke pretzel sticks around in your mud pies just before serving. 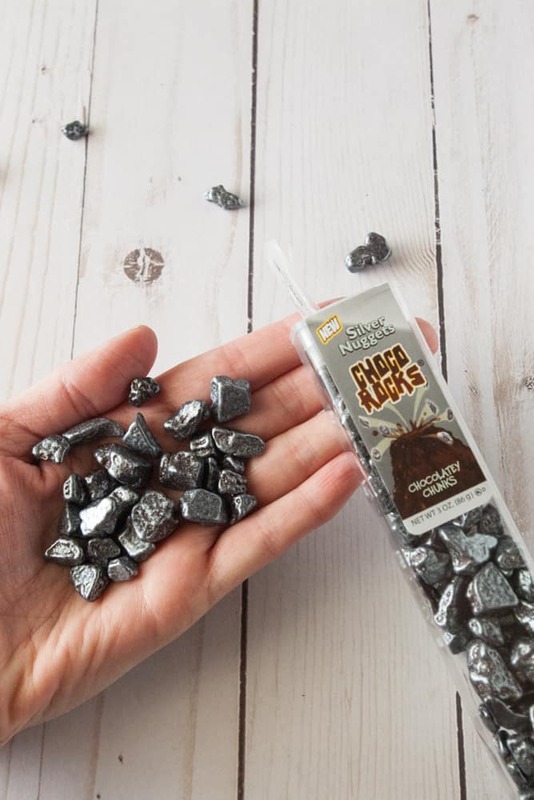 I bought my tubes of Choco Rocks at Hobby Lobby by the construction themed party stuff. Coarsely chopped silver sixlets would work too!